It was summer time. The depressing slate backdrop of the Canadian Rockies was covered in miles and miles of green. I had known the Rockies in winter, the snow then adding a dash of mystery to the dominating heights and endless prairie land. We were on the Trans-Canada Highway from Calgary, Alberta, driving towards Banff and onwards to Jasper. This was my first visit to Jasper, Canada’s earliest national park established in 1885. 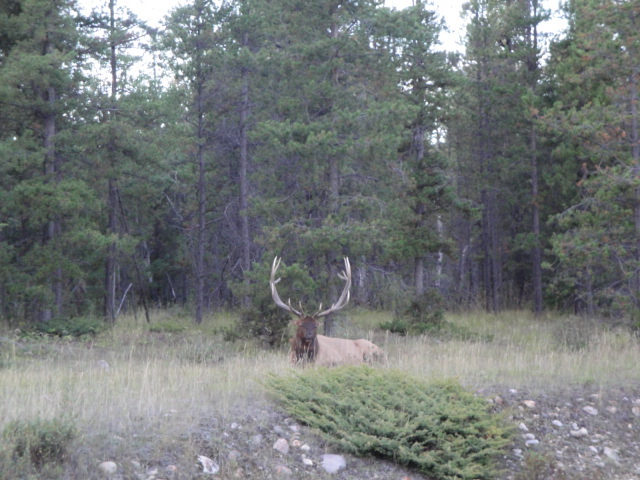 The main purpose of the trip was to see wildlife: bears, elks, caribou, coyotes and other mountain animals. 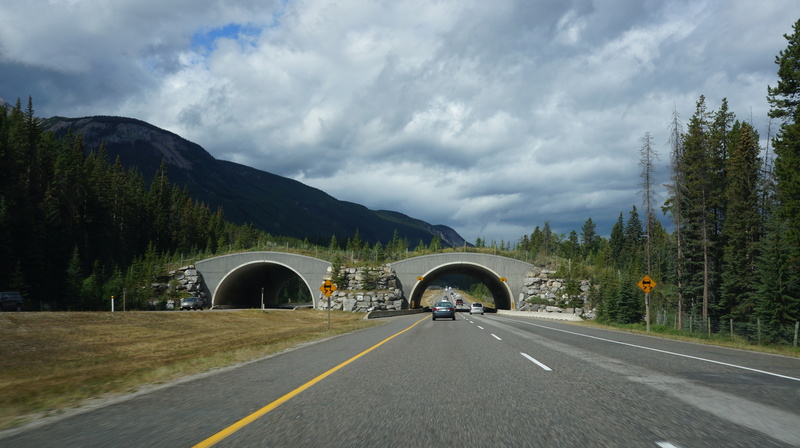 Banff and Jasper National Parks are designated wildlife territory and continuous road signs, fenced forests and special animal pedestrian bridges camouflaged with greenery, remind motorists to give way to these exalted species. I sat glued to the car window; a week earlier, friends had come across a bear family, and any movement in the dense forests along the road and I was ready to click. Over three days and many miles in the parks, wildlife continued to elude us. We had to be content with a solitary raven, two chipmunks playing hide and seek and a majestic caribou squatting on its rocky perch. 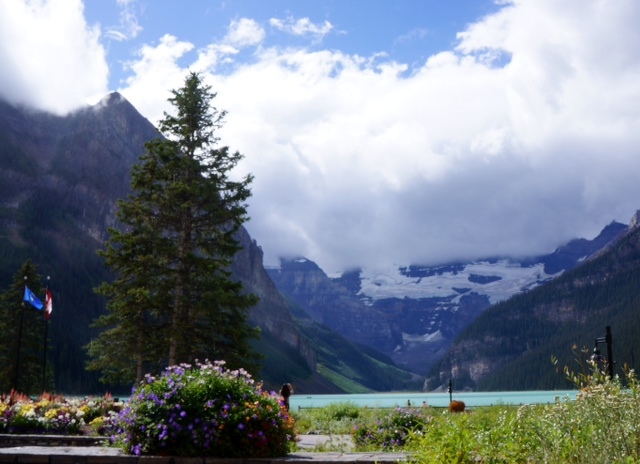 Our first stop was at Lake Louise, some 183 kilometres from Calgary, to savour the summer sheen of emerald waters encapsulated by frosted mountain peaks and the majestic Victoria Glacier. 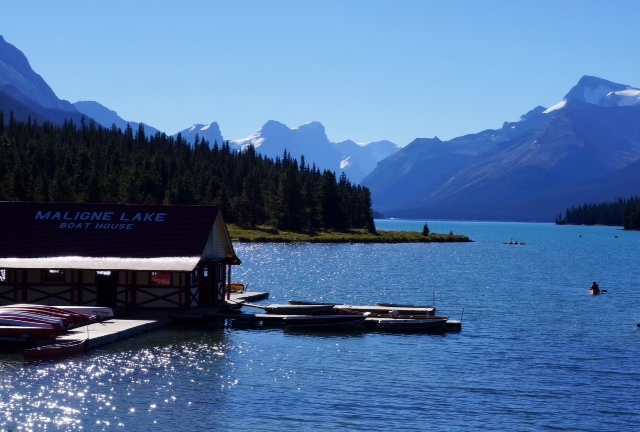 Summer or winter this is a bustling scenic tourist spot and we joined others to stroll the 5-kilometre lakeside promenade resplendent with colourful blooms and flanked by the imposing Fairmont Chateau Lake Louise, holiday chalets, and biking, hiking and horse riding trails. It was difficult to visualize that in April 2012 we had traversed nearly half the length of the then frozen 2.5-km-long and 90-metre-deep alpine lake. Countless digital shots of the lake from every possible angle and a quick snack at the Fairmont Chateau Deli and we were our way to Columbia Icefield a little over an hour’s drive away. The Icefields are on the northern tip of Banff National Park and connected to Jasper National Park by the icefield Parkway, a 480-kilometre drive through a staggering landscape of towering rugged peaks clawed by voluminous glaciers that melt into lakes, rivers, lush forests and valleys. The incredible blues and greens of the lakes are something unique to the Rockies, and Bow Lake between Banff town and Lake Louise and in the foothills of Crowfoot Mountain is no exception. A few minutes admiring the tranquility of the aquamarine waters and we were back on the Icefields Parkway with no shadow of a bear or wolf or big horn sheep. Maybe the timing of our trip – the first week of August – clashed with wildlife vacations! The glaciers, or rivers of ice, were something out of geography books, and here we were at an elevation of 3,000 metres driving up to the largest ice mass south of the Article Circle on the Continental Divide of North America. The only sign of height was the changing landscape of unbroken, bleak, snowy terrain merging with expansive cerulean space and blustery winds, no trees to break their icy blast. After some procrastination as whether to leave the warmth of the car, we took the short trek to the foot of the Athabasca Glacier. The icefield is enormous and has a depth that equates to the height of New York’s Empire State building. It includes six glaciers in its icy confines of which only three, Athabasca, the Dome and Stutfield, are visible from the icefield. 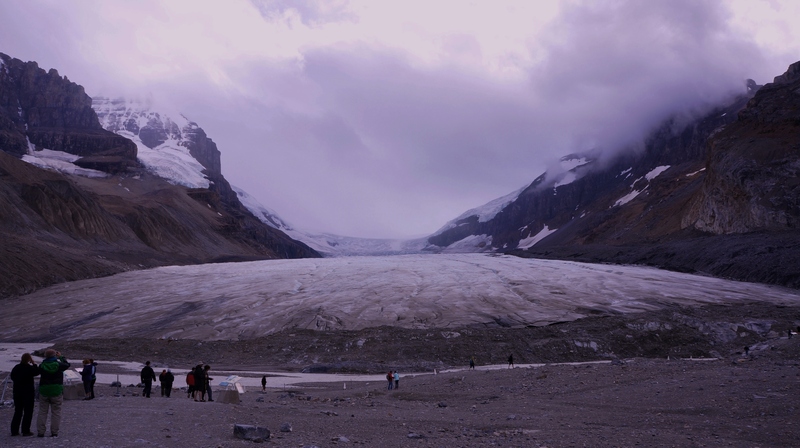 The Athabasca Glacier is accessible by foot or by a ninety-minute excursion aboard the massive Brewster Ice Explorer snow coach from the Columbia Icefield Discovery Centre. The coach tour is informative, but we preferred to walk to the “toe” of Athabasca. Visitors are not allowed beyond designated areas; the snow-covered crevasses are dangerous and the guides make much of casualties of the past. From our vantage point the glacier appeared to be painted on the rocky surface giving a 3D effect. In reality the glacier moves a few centimetres a day and is said to be receding. The other glaciers fed by the icefield are Castleguard, Columbia and Saskatchewan. We lingered on mesmerized by the solid blue-hued ice formations until our down jackets felt inadequate against the chilly winds. By the time we reached the car it was nearly evening, and with the setting sun as our GPS on the lonely Icefields Parkway we still had to reach our destination. The day’s journey was taking its toll and during a brief “stretch your legs” walk on the boardwalk suspended over the Sunwapta Falls I was seeing images of slackers and strollers and umbrella spikes of crowded Hong Kong pavements in the gushing waters forcing their way through the cliffs into the deep gorge. The “Gentle Giant of the Rockies’. 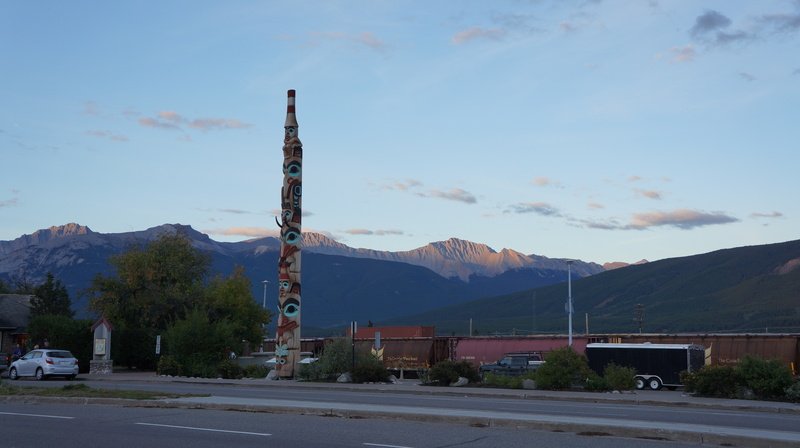 It was time to move on and the twinkling lights of Jasper town, the “gentle giant of the Rockies” were a welcoming sign of a laid-back mountain experience peppered with adventure, discovery and relaxation. It was 10 p.m. and the main road, Connaught Drive, with restaurants and shops and the railway station on opposite side, was swarming with bright-eyed visitors, octogenarian groups seeking freshness, backpackers on their way to adventure trails on foot or cycles, families and tour groups relaxing in the fresh mountain air. The Connaught Drive and Patricia Street are the main shopping and eating areas of this hilly boutique town. s oldest and largest national park. The next day, a clear bright day perfect for ‘ walking’ the minuscule town of timber and brick buildings, refurbished into historical landmarks, including the Post Office along Elm Avenue and Geikie Street, the Jasper Library across from the elementary school that was once a jail and the Jasper Yellowhead Museum & Archives. The Museum has a prominent display of Marilyn Monroe posters and pictures taken when the popular American actress had visited Jasper for the shooting of Otto Preminger’s 1954 western, River of No Return. Monroe with her effervescent personality and beauty must have revved up the quiet town similar to what the present day bikers were doing riding past on Jasper’s streets oblivious of noise pollution. 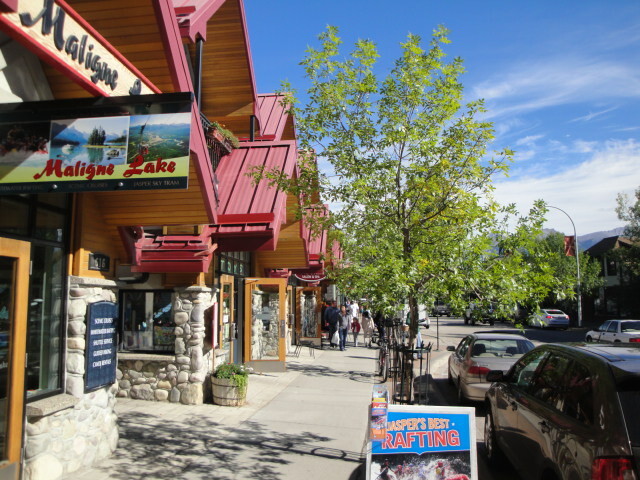 Jasper is an outdoorsy town and we followed the crowd driving to Maligne and Medicine Lakes and Miette Hot Springs about twenty-five minutes south of Jasper. Medicine Lake, one of the largest sinking lakes in the Western Hemisphere, because of its underground drainage system and spring fill, was a bit of a disappointment. It was more mudflats and scattered pools than extended waters. The Aboriginal people considered the natural phenomenon of disappearing water in summer as sinister. 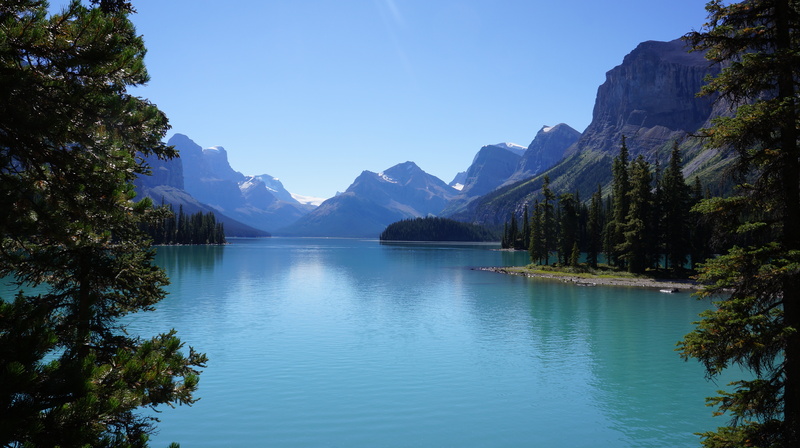 In comparison the 22-kilometre stretch of Maligne Lake is straight out of an artist’s canvas of dazzling blues and greens. We took the 90-minute Readers Digest-endorsed “best Boat Cruise in Canada” past glacier-studded mountain peaks and Spirit Island at the south end of the lake. The island, the face of postcards and pictures, turned out to be a speck of land till you listened to the guide, a college student on a summer job, romanticized about its First Nations’ mythology of being the meeting place for two young lovers from feuding tribes. Ultimately they were discovered and the girl’s tribal chief father banned her from returning to the island. The jilted lover waited and waited and eventually died on the island leaving his spirit behind. The other story weaved around the word “Spirit” referred to the island being used to stash booze during prohibition and was mundane in comparison with the Romeo and Juliet alternative. The return journey was information-free enabling us to enjoy the beauty and serenity of the lake and its surroundings and to visualize a past when there were no noisy tourists trying to extract the maximum from nature. The Maligne Lake Chalet, a former speck of luxury in midst of wilderness for horse riders and hikers, had re-opened in 2011 laying out impressive afternoon tea treats. Having not booked in advance we had to be content with the ‘The View’, a restaurant with a wraparound wooden deck and an extravagant view of the lake and beyond. The Miette Hot Springs, tucked away in panoramic Fiddle Valley of mineral-rich luxurious hot waters, was at one time the favoured soaking place of the natives and the fur traders and miners from the nearby Pocahontas mines. The popularity of the springs, reached by a trail from the mines, led to construction of a bathhouse in 1933 and later two more bath houses were added. We had picked a bad day, a Sunday around 3 p.m., with never-ending queues of families, brawling kids, seniors, awaiting their turn for a dip in the rejuvenating waters and even when we left at 6 p.m., there were people waiting with their towels and costumes. The five main minerals found in the Miette Hot Springs are sulphur, calcium, bicarbonate, magnesium and sodium. On our return to the city we spotted a Caribou resting on the ledge, a photo-op pose and we had finally seen some ‘wild life’. Next on agenda, on last day, was the narrow winding mountain road to Mt Edith Cavell, one of the most rugged summits of Jasper National Park in the Athabasca River and Astoria River valleys. Adding glamour to the austere surroundings is a phenomenal glacier tumbling down a 300-metre cliff. The glacier with spreading wings was named ‘Angel’ in 1926 to honour an angel of mercy, Edith Cavell, an English nurse who was executed for helping allied soldiers escape during World War I. The ice wings protectively draped across the lacerated Mt. Edith Cavell reflect Edith’s compassion and commitment, but the melting ice is causing the glacial wings to slowly lose their shape. 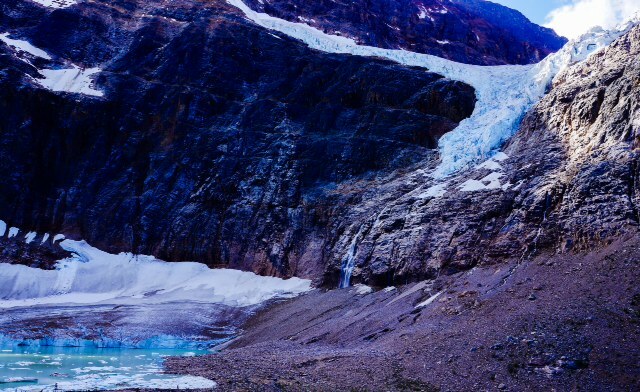 The hiking trails snaking towards the look-out facing the glacier, pass through rocky terrain and once on top offer a magnificent view of the Angel glacier dripping into the turquoise Cavell Pond at foot of Mount Edith Cavell. The collapse of nearby Ghost Glacier in the summer of 2012 had made the area inaccessible, but we were in luck as the area had re-opened a week before our visit. The picnic areas and the lower reaches were still closed to the public though a few brave hearts had managed to sneak their way down to the Pond. A glacial roar and an ice fall prompted the supervisor to blow his whistle and dashing my hopes of joining the people down below. Finally it was time to return to city life, to Calgary, and although there had been no face to face with grizzlies or elks, the synergy of an effervescent natural canvas had more than compensated for missed appointments.